Paper Banner, around 1863. Gift of Dr. Clara S. Ludlow, 1911. Lincoln faced pressure on all sides. Radical Republicans called for immediate abolition. Proslavery Northerners and Southern Unionists threatened to end their support if they were compelled to fight to end slavery. Enslaved African Americans took emancipation into their own hands by escaping across Union lines. In the summer of 1862, Lincoln drafted an executive order on slavery. Published in September, it declared that, as of January 1, 1863, all persons held in slavery in areas still in rebellion would be “then, thenceforward, and forever free.” Although the Emancipation Proclamation did not directly free any enslaved people in Union-controlled areas, it was widely understood that a Union victory would mean the end of slavery. Publishers throughout the North printed decorative copies of the Emancipation Proclamation after its enactment. R. A. Dimmick published this engraving in 1864. This brass inkstand sat on the desk of Maj. Thomas Eckert in the War Department telegraph office. At the time, the War Department handled all the president’s telegrams, and Lincoln often stopped by to learn the latest news of the war. According to Eckert, the president composed an early draft of the Emancipation Proclamation while sitting at his desk in the summer of 1862. "The President came to my office every day and invariably sat at my desk. . . . I became much interested . . . with the idea that he was engaged upon something of great importance, but did not know what it was until he had finished the document and then for the first time he told me that he had been writing an order giving freedom to the slaves of the South, for the purpose of hastening the end of the war. . . . I still have in my possession the inkstand which he used at the time." The painting depicts the cabinet meeting on July 22, 1862, when Lincoln first revealed his intention to declare the emancipation of all persons held as slaves in states still in rebellion. It was Lincoln’s proudest achievement, and he granted Francis Bicknell Carpenter’s request to create a painting commemorating the moment. For six months Carpenter lived in the White House and used the state dining room as his studio. The original painting now hangs in the U.S. Capitol. "If my name ever goes into history it will be for this act, and my whole soul is into it." Watch this short movie about the history and impact of the Emancipation Proclamation. Video courtesy of the History Channel. 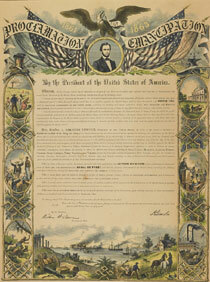 Abraham Lincoln and the Emancipation Proclamation from Nat Museum of American History on Vimeo.